Wash and cut chicken into small pieces and mix it with chilli powder and pinch of salt and keep aside. 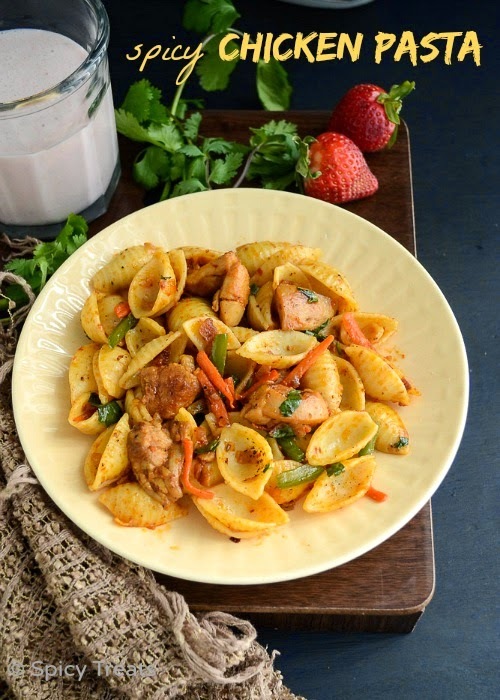 Cook Pasta as per package instructions, drain excess water, drizzle with oil and keep aside. Chop onion, carrot, capsicum, garlic and keep aside. finely chopped onions and saute until it turns golden brown. After that add chicken pieces, chilli flakes and stir fry in medium heat for 2-3 minutes. And then add chicken masala powder, sprinkle little salt and stir fry for 4-5 minutes. And cook covered for few more minutes or until chicken gets tender. Then add tomato puree, chopped carrot and stir fry until tomato puree thickens. Now add capsicum and stir fry for a minute and add cooked pasta, enough salt. Stir well and cook covered for a minutes. Lastly add some freshly ground pepper, stir well and garnish with cilantro. That's it...Yummy Chicken Pasta ready. 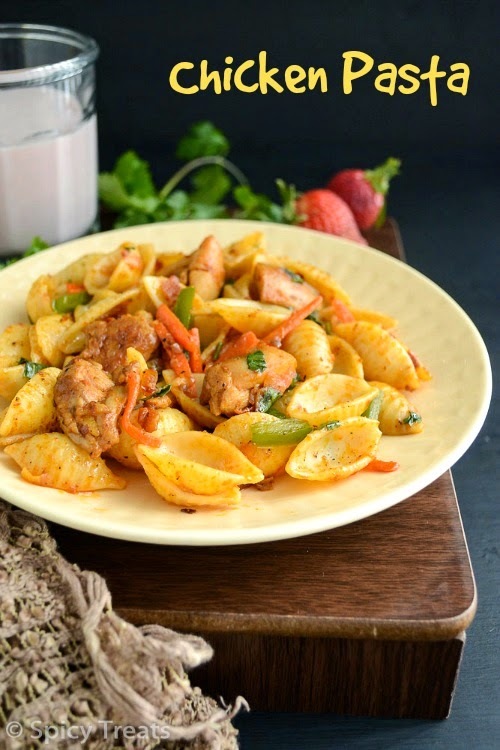 *Chicken Masala Powder can be replaced with Garam masala or curry powder. For veggie version, instead of chicken you can use Mushrooms or Soy chunks. 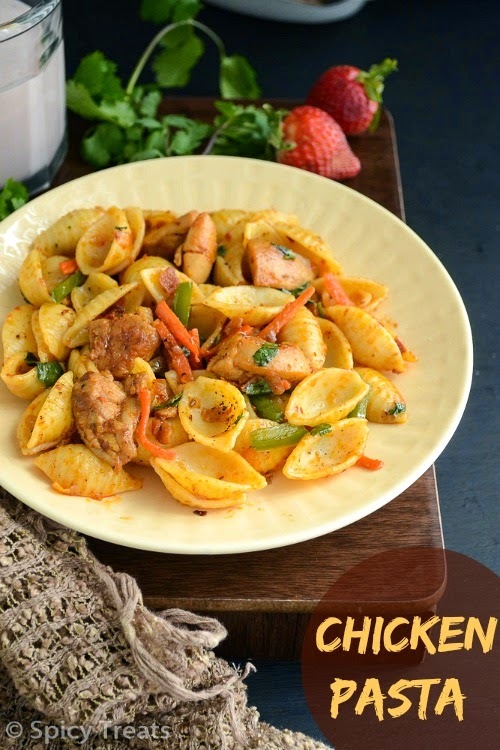 With the same method instead of Pasta you can also use Hakka Noodles for Chicken Noodles. Likewise you can use desired pasta or spaghetti. yummy pasta with chicken,loved it!! 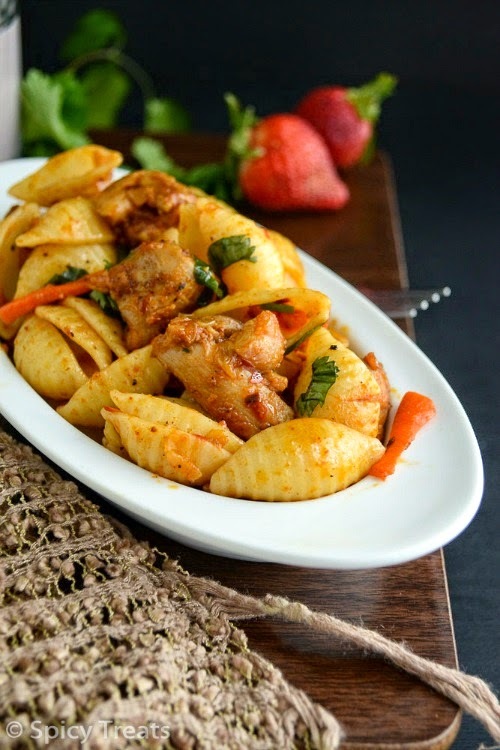 Wish i get that plate rite now from my lappy screen, irresistible pasta and my kids will definitely love this spicy pasta.